Could the firefighter emergency responder population also benefit from training on resilience skills, as school-age children and military populations have? 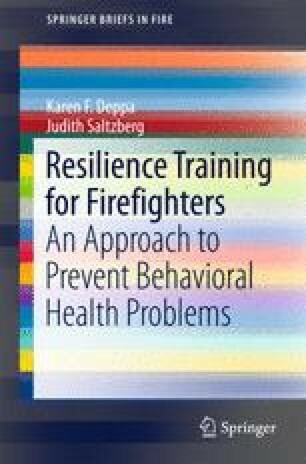 In order to investigate this and recommend an appropriate intervention strategy, this chapter looks at what the literature says about the key factors that influence firefighter behavioral health. In a review of literature that identifies vulnerabilities and protective factors associated with behavioral health in the fire and emergency services, several factors turn up repeatedly. They provide clues to the interventions that might be most effective in a resilience training approach with this population. Chamberlin, M. J. A., and Green, H. J. (2010). Stress and coping strategies among firefighters and recruits. Journal of Loss and Trauma, 15(6), 548-560. doi: 10.1080/15325024.2010.519275. Regehr, C. (2009). Social support as a mediator of psychological distress in firefighters. The Irish Journal of Psychology, 30(1-2), 87-98. doi: 10.1080/03033910.2009.10446300.